Speed doesn't matter, and there's no such thing as a "math person." How the Common Core's approach to the discipline could correct these misperceptions. Mathematics education in the United States is broken. Open any newspaper and stories of math failure shout from the pages: low international rankings, widespread innumeracy in the general population, declines in math majors. Here’s the most shocking statistic I have read in recent years: 60 percent of the 13 million two-year college students in the U.S. are currently placed into remedial math courses; 75 percent of them fail or drop the courses and leave college with no degree. We need to change the way we teach math in the U.S., and it is for this reason that I support the move to Common Core mathematics. The new curriculum standards that are currently being rolled out in 45 states do not incorporate all the changes that this country needs, by any means, but they are a necessary step in the right direction. I have spent years conducting research on students who study mathematics through different teaching approaches—in England and in the U.S. All of my research studies have shown that when mathematics is opened up and broader math is taught—math that includes problem solving, reasoning, representing ideas in multiple forms, and question asking—students perform at higher levels, more students take advanced mathematics, and achievement is more equitable. One of the reasons for these results is that mathematical problems that need thought, connection making, and even creativity are more engaging for students of all levels and for students of different genders, races, and socio-economic groups. This is not only shown by my research but by decades of research in our field. When all aspects of mathematics are encouraged, rather than procedure execution alone, many more students contribute and feel valued. For example, some students are good at procedure execution, but may be less good at connecting methods, explaining their thinking, or representing ideas visually. All of these ways of working are critical in mathematical work and when they are taught and valued, many more students contribute, leading to higher achievement. I refer to this broadening and opening of the mathematics taught in classrooms as mathematical democratization. When we open mathematics we also open the doors of math achievement and many more students succeed. In mathematics education we suffer from the widespread, distinctly American idea that only some people can be “math people.” This idea has been disproved by scientific research showing the incredible potential of the brain to grow and adapt. But the idea that math is hard, uninteresting, and accessible only to “nerds” persists. This idea is made even more damaging by harsh stereotypical thinking—mathematics is for select racial groups and men. This thinking, as well as the teaching practices that go with it, have provided the perfect conditions for the creation of a math underclass. Narrow mathematics teaching combined with low and stereotypical expectations for students are the two main reasons that the U.S. is in dire mathematical straights. This summer I taught a course through Stanford’s open online platform explaining research evidence on ability and the brain and on good mathematics teaching, for teachers and parents. The course had a transformative effect. It was taken by 40,000 people, and 95 percent said they would change their teaching or parenting as a result. Hundreds wrote telling me that the ideas in the course had been life-changing for them. Teachers and parents are open to research, and new technologies are finally providing a way that important research evidence, on mathematics, learning, and the brain, can reach the audiences that need them. Conrad Wolfram, cofounder of Wolfram-Alpha, one of the world’s most important mathematical companies, has spoken widely about the mismatch between the math that people need in the 21st century and the math they spend most of their time on in classrooms: computing by hand. The Common Core helps to correct this problem by embracing broader mathematics and requiring the use of advanced technology, such as dynamic geometry software. Students in the Common Core will spend less time practicing isolated methods and more time solving applied problems that involve connecting different methods, using technology, understanding multiple representations of ideas, and justifying their thinking. For example, consider the following two published test questions. The first comes from California’s old standards, the second from the Common Core. 1. 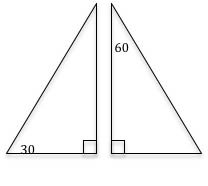 Which of the following best describes the triangles shown below? Is DEF always, sometimes, or never congruent to ABC? Provide justification to support your conclusion. The second question, from one of the Common Core assessment teams, does not simply test a mathematical definition, as the first does. It requires that students visualize a triangle, use transformational geometry, consider whether different cases satisfy the mathematical definition, and then justify their thinking. It combines different areas of geometry and asks students to problem solve and justify. It does not offer four multiple-choice options. Common Core mathematics is more challenging than the mathematics it will replace. It is also more interesting for students and many times closer to the mathematics that is needed in 21st-century life and work. An important requirement in the Common Core is the need for students to discuss ideas and justify their thinking. There is a good reason for this: Justification and reasoning are two of the acts that lie at the heart of mathematics. They are, in many ways, the essence of what mathematics is. Scientists work to prove or disprove new theories by finding many cases that work or counter-examples that do not. Mathematicians, by contrast prove the validity of their propositions through justification and reasoning. Mathematicians are not the only people who need to engage in justification and reasoning. The young people who are successful in today’s workforce are those who can discuss and reason about productive mathematical pathways, and who can be wrong, but can trace back to errors and work to correct them. In our new technological world, employers do not need people who can calculate correctly or fast, they need people who can reason about approaches, estimate and verify results, produce and interpret different powerful representations, and connect with other people’s mathematical ideas. Another problem addressed by the Common Core is the American idea that those who are good at math are those who are fast. Speed is revered in math classes across the U.S., and students as young as five years old are given timed tests—even though these have been shown to create math anxiety in young children. Parents use flash cards and other devices to promote speed, not knowing that they are probably damaging their children’s mathematical development. At the same time mathematicians point out that speed in math is irrelevant. One of the world’s top mathematicians, Laurent Schwartz, reflected in his memoir that he was made to feel unintelligent in school because he was the slowest math thinker in his class. But he points out that what is important in mathematics “is to deeply understand things and their relations to each other. This is where intelligence lies. The fact of being quick or slow isn't really relevant.” It is fortunate for Schwartz, and all of us, that he did not grow up in the speed- and test-driven classrooms of the last decade that have successfully dissuaded any child that thinks deeply or slowly from pursuing mathematics or even thinking of themselves as capable. The new Common Core curriculum gives more time for depth and exploration than the curricula it has replaced by removing some of the redundant methods students will never need or use. Sadly it does not go far enough in this regard, and the high-school grades in particular are still packed with obsolete content. But educational progress is rarely fast and the changes implemented in the Common Core are a step in the right direction. The U.S. does not need fast procedure executors anymore. We need people who are confident with mathematics, who can develop mathematical models and predictions, and who can justify, reason, communicate, and problem solve. We need a broad and diverse range of people who are powerful mathematical thinkers and who have not been held back by stereotypical thinking and teaching. Common Core mathematics, imperfect though it may be, can help us reach those goals. Jo Boaler is a professor at Stanford University's Graduate School of Education and the CEO and cofounder of YouCubed, which provides math-education resources for students, parents, and teachers.